David Sklansky, considered by many as one of the great thinkers and players of the game, has his best chance in about 20-odd years to actually earn that distinction, as he finds himself (short-stacked) at the WPT Borgata Poker Open. Winner of three WSOP bracelets, Sklansky achieved acclaim as author of the mind-numbingly boring Theory of Poker (and other books, please stop). He looks to earn his first major tournament victory since capturing the, um, $1,000 buy-in PLO event at the 1983 World Series of Poker. Sklansky won his two other bracelets in 1982, one in Draw poker, and the other in Mixed Doubles 7CS, which really shouldn’t even count anymore. And while sort of speaking of women, Jennifer Tilly’s impressive run came to an unfortunate end, as she was eliminated in 15th place by big stack Mark Newhouse. Newhouse is from Chapel Hill, NC, final tabled earlier this year at Event #23 at the WSOP, and takes a huge chip lead to his first WPT final table. Final table chip counts are: 1) Mark Newhouse – 7,025,000, 2) Chris McCormack – 3,000,000, 3) Chris Bell – 1,200,000, 4) Blaise Ingoglia – 840,000, 5) Anthony Argila – 700,000, and 6) David Sklansky – 665,000. 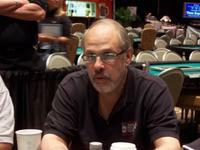 * Sklansky image from Poker Pages.